The figurines in this section are Retired and are a part of the Horse Of A Different Color Collection. Westland Giftware was the original producer of the Trail Of Painted Ponies. This new collection appeals to everyone from the novice collector to the horse lover. With their variety of colorful, classic designs you will enjoy decorating and displaying each piece from "Horse Of A Different Color". The kaleidoscope of horses depicts many breeds, capturing the beauty of one of nature's most beloved creatures. Each figure is intricately designed and sculpted with beading and bold patterns which celebrates the history and grace of the horse. Each figure will be limited to a single edition of 10,000 pieces with a limited edition coin embedded in the base. From the original producers of the Trail Of Painted Ponies comes the new collectible "Horse Of a Different Color". Colorful, and classic embody this new collection. Whether a native collector or a horse lover, you will enjoy decorating and displaying a "Horse Of A Different Color". The kaleidoscope of horses depicts many breeds, capturing the beauty of one of nature's most beloved creatures. Adorned with sculpted patterns of beading and bold patterns, they celebrate the history & grace of the horse. Each figure will be limited to a single edition of 10,000 pieces with a limited edition coin embedded in the base. From the original producers of the Trail Of Painted Ponies comes the new collectible "Horse Of a Different Color". This new collection appeals to everyone from the novice collector to the horse lover. With their variety of colorful, classic designs you will enjoy decorating and displaying each piece from "Horse Of A Different Color". The kaleidoscope of horses depicts many breeds, capturing the beauty of one of nature's most beloved creatures. Each figure is intricately designed and sculpted with beading and bold patterns which celebrates the history and grace of the horse. Each figure will be limited to a single edition of 10,000 pieces with a limited edition coin embedded in the base. From the original producers of the Trail Of Painted Ponies comes the new collectible "Horse Of a Different Color". This new collection appeals to everyone from the novice collector to the horse lover. With their variety of colorful, classic designs you will enjoy decorating for Christmas with the ornaments from the "Horse Of A Different Color" collection. Each ornament is intricately designed and sculpted with beading and bold patterns which celebrates the history and grace of the horse. 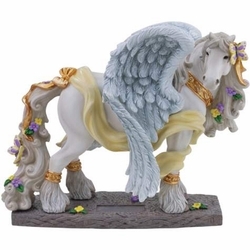 Each ornament reflects the image and artistry of its companion figurine.